So I spent a fair amount of posts devoted to what seems to be a battle of “visions” going on in Second Life. A string of posts starting with this one I wrote a year ago. I have written so many I just decided to create a new sl visions tag. Click to see all the related posts. So here is the story in a paragraph. There have been three competing “visions” of what SL should be: The role-player vision, the merchant vision, and the 3D Facebook vision. Since the resignation of the last CEO Mark Kingdon, the temporary CEO Philip Rosedale has systematically disassembled the 3D Facebook vision, largely because it is unworkable (as I predicted). Because of the resources spent, changes requested by the merchants have not only not happened, but actually they are worse now. Merchants continue to quit with profits way down. That leaves us role players basically in charge, and if you have seen the latest re-design of the main Second Life page, you will see, that SL has recognized it as well. We are back to “Your World, Your Imagination” again (though not in those exact words). Now many of these I am sad to see are disappearing, while others I say good riddance. What they are doing is simplifying the whole thing. Simplifying, always a good thing. The general philosophy is now a “hands off” policy, meaning they are giving us players more autonomy. Here is what they all have in common: They are all good for us role players. If you are in SL because you enjoy pretending you are someone else, whether that is a formal role player in a community, or an informal role player pretending to be someone you are not, then SL seems to be catering to you again, after a couple of years where they weren’t. Here’s the cloud to go along with that silver lining. Philip Rosedale has stepped down, and Linden Lab is once again looking for a new CEO. Furthermore, there is good evidence that the remaining employees don’t really seem to “get” the whole RP vision thing. Here is hoping they hire someone who does. Unfortunately, I am not that hopeful. So there are now two different visions left about what Second Life is, or should be. What vision you are apart of is largely based on what motivates you to play. I call these visions “role play” and “merchant” as a short hand way of understanding them. There are builders who build for fun, they are part of the role play vision. There are builders who build for profit, they are part of the merchant vision. There is a lot of mixing and gray area obviously. We can all see that SL has plateaued, and will likely decline soon. This is very bad for the Merchants. It is possible that Mesh could revitalize the market, but I am leaning to the idea that it will radically change the market so much that it is unlikely to help the current merchants. Most of us Role Players have accounts in other places, especially many open sim grids. When SL closes, we’ll probably spend a little time mourning, then we’ll be elsewhere. Us non-merchant types will likely move on to Open Sim and start building there. Heck, a lot of them already are. Similarly the various role play communities would move and rebuild as well. The Merchants don’t have many other places to go. With no currency, no theft protection, no one to file a DMCA complaint to, the merchants have no desire to move to Open Sim, even if there were no SL. The market place in SL is one of a kind, the closest is IMVU, and it is about a tenth of the size of SL. The RPers may have built SL, but it is the merchants that made SL popular, they provide most of the content we RPers enjoy. We non-merchant RPers are better off with the merchants around, which means we are better off with SL around. I believe that when SL eventually closes, there will be a new virtual goods market somewhere, innovation abhors a vacuum. Maybe not of the same nature as SL, but I see other virtual good markets, like Renderosity and various app markets, succeeding in other similar venues, so it is only a matter of time before there is another virtual goods market where creative people can make a few bucks. This is another topic I have already written about. 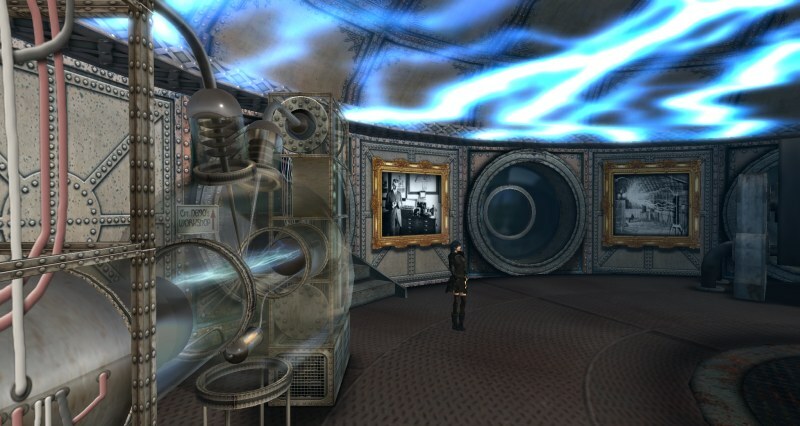 Some of the commercial OpenSim grids have excellent content protection measures in place. InWorldz and SpotOn3D in particular bend over backwards to protect content creators, have a simple and responsive takedown policy, and prohibit or restrict movement of content off of their grid via hypergrid teleports or region (OAR) backups or inventory (IAR) backups. The more open grids, like OSGrid and ReactionGrid, which allow hypergrid teleports and region exports, also have policies in place. Even new grids take it seriously — the last thing a startup grid wants to face is a copyright infringement lawsuit from a group of content creators. The hard part right now is policing it — a content creator can’t be expected to visit every single region on every single grid and look for stolen content. And there are no decent cross-grid search options available. However, content creators can keep an eye on the top freebie stores (such as Samsara on OSGrid) and on central shopping districts on InWorldz and SpotOn3D. If your content shows up, grid managers tell me that they have the capability to remove all offending content from all user inventories at once by doing a database search. In addition, there are two multi-grid currency systems now popular in OpenSim. They are the G$ multi-grid currently, currently used in a dozen grids (but is fictional — the backers will convert it back into real money) — and the OMC currency, used on 20 grids, and fully convertible to the US dollar, Euro, and Linden Dollar. The OMC will even show your balance in the top right of the viewer whenever you’re on an OMC-enabled region. They are both coded to your avatar, so you hypergrid teleport from grid to grid, to shopping on each one, and then bring stuff home to your own grid. Sorry, correction — the G$ is fictional and its backers will NOT convert it (though there maybe third parties willing to take your G$’s off your hands). I think your visions are pretty much accurate, Arian and you lay it out very clear and readable. What you wrote is both an eye-opener and worrying. However, I think Opensim has now finally arrived at beta state and the coming year will see important developments both for SL and OS. Linden Labs has made so many blunders and alienated so many of us – particularly role players – that I doubt very much even mesh will save them from downfall but I am sure something will come from the ashes. Perhaps they will end up offering an asset service to try and stay in the market and hold onto the merchants. I think they have more chance of holding onto the facebook vision as you describe it but the role players are already leaving. Opensim is gaining them steadily and it is just a matter of time now when the trickle becomes a flood. I am pretty sure of that. I have four role play sims in SL myself and talks with my players indicate they will try anything I build in Opensim, especially if it is bigger, better and less laggy than SL and my plan is too set up something in OS in parallel to SL using both as portals to each other while embracing Hypergrid as it becomes more secure so I am definitely formulating plans to move. I would have done it much sooner had Opensim been ready but it has been a slow development and there are still problems to be solved even now but I am confident that OS will be in beta at some point in the new year and not before time given the state of SL and the apathy so many of use feel. While there have certainly been some shake ups, I think Linden Labs (for the most part) is back on the right track with Second Life. The talk about a 3D Web experience like Facebook, and the Avatar’s United were what I’d call the off course directions. As for Viewer 2 (as it is now and the improvements its getting) and the merging of the teen grid, mesh, media on prim, and making outfits via shortcut links in inventory, those are IMO right on track. As for the loss of discounts for NPO’s I feel that is an unfortunate side effect of Linden Labs misadventures and the economy. Maybe one day this can be reestablished in some fashion as the Lab and the economy recover. As for the OpenSims, I’ve been to several and applaud them for their accomplishment, I even run an OpenSim on a USB stick and it is cool. However, regardless of them adding mesh and establishing currencies, what I’ve been experiencing in those worlds are still at least 2 years behind Second Life in stability and reduced lag. For instance on several occasions I’ve been on a couple virtual worlds, and with only 5-10 avatars on that sim, experienced the lag of the equivalent of a Second Life sim with 80-90 avatars on it. Maybe they are oversubscribing those sims, but I’ve tried this out several times assuming it was just a bad day or bad sim on the grid, but they are consistently laggy and buggy. One of the virtual worlds (with holding name), I could not even get their viewer to run, even with repeated attempts and installs. OpenSim virtual worlds still have just fractions of the community that Second Life currently enjoys. I’m not picking on OpenSims, they have done allot, but I think they still have some growing to do… maybe soon they will be as good as Second Life or better… but not today. Having said the above, I don’t think Second Life should rest on their current advantage. I think they should look at connecting to the Metagrid, and maybe even coming up with a home sim. One where the avatar can run their “home sim” on their own computer, and they can connect it to the Second Life grid. Also this issue of not being able to take your inventory with you to another grid is a thorn that needs removed. I think if an OpenSim meets certain conditions regarding IP, then we should be able to freely crossover to another grid with inventory intact. It’s what the avatars want, give it to them and Live Long and Prosper. The progression from virtual gamers to merchants to commercialization to demise seems to identify commercialization as the culprit. The Linden attitude toward performers has been, at best, flaccid and that alienated many. That attitude resulted in an increase in revenue but a decrease in attractions and that, I suggest, is the reason SL fail, assuming it fails at all. I would like it to succeed, to grow, and to evolve. I staged my show in SL for many years and would be back already if not for circumstances that don’t need to be detailed here. However, I’m seeing pessimistic forecasts for its survival from more than one person so I wonder if that’s the pessimism inherent in pretty much everything these days or if SL really is going to die. I’m convinced that SL will close sometime in the next decade, I have no guess when or under what circumstances (RL economy, lawsuits, competition, massive server failure, or just natural decline), but it will happen. Nothing is permanent. But I am taking the attitude of enjoying it while it lasts. Open Sim grids are likely to be around well past the SL closing date, and they may actually prosper after the SL era. The only reason why they wouldn’t is if something better comes around, which is also a good thing.